Set in 1929 New York, we see the New York Gangster story revised with a sticky twist! Dandy Dan’s hoodlums terrorise the local district, exterminating undesirables with their new weapon splurge guns. His rival is Fat Sam Stacetto, who runs the Grand Slam Speakeasy, but Fat Sam’s gang still use old fashioned pies. Fat Sam engages the help of Bugsy Malone, a smooth city slicker who hitherto has been more occupied in sweet talking Blousey Brown, a would-be girl singer. 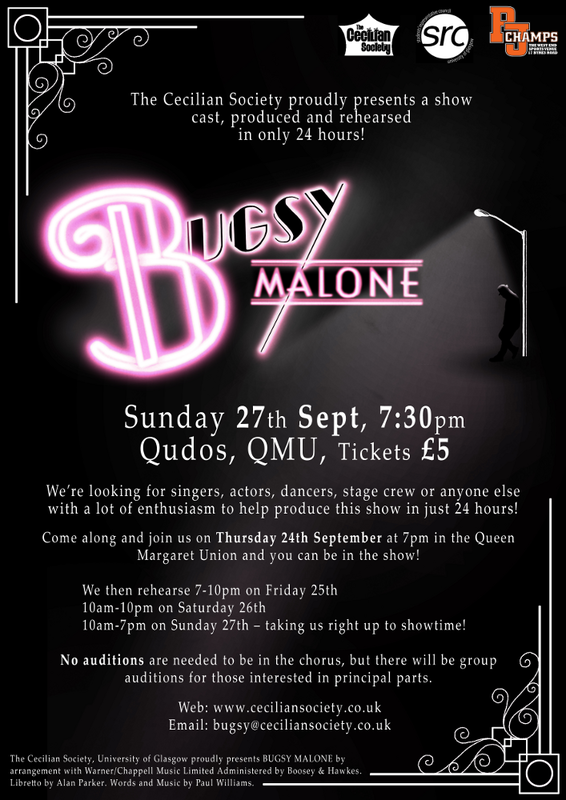 Bugsy Malone is a popular musical in the society. We’ve done it a total of 5 times, and our 2009 production was not to be surely missed! Our audience seemed to love the sticky situations our characters were left in after the custard and pie fights, and the character of Fat Sam will always have a special place in the society’s heart.